A Toronto man faces 13 charges in connection with a three-vehicle crash that left a 60-year-old man dead and his daughter critically injured. Dangerous operation of a motor vehicle causing death. Failure to stop at the scene of an accident causing death. Theft and fraud charges, as well as possession of property obtained by crime. 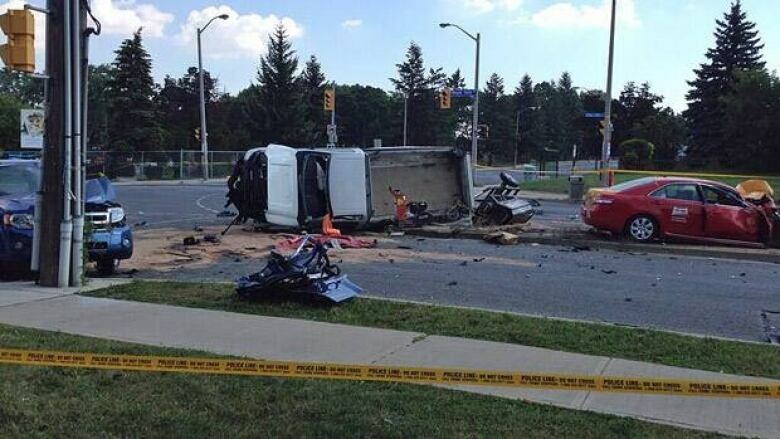 The collision happened at Royal York Road and Lawrence Avenue West shortly before 8:30 a.m. Monday. A 23-year-old man was driving a taxi cab that had been stolen earlier in a fare dispute, according to the cab company. The cab company said the dispute began when the man was upset about his fare. The driver felt threatened, got out of the car and that's when the passenger allegedly climbed into the driver's seat and drove off. The cab ran a red light at Royal York Road and Lawrence Avenue West and struck a pickup truck before flipping over and crashing into a Ford Escape. This sent the SUV into a pole, according to police. The 60-year-old driver of the SUV was rushed to hospital with life-threatening injuries, but later died. His 39-year-old daughter, who was also in the vehicle, was in critical condition after the crash. The 42-year-old man from the pickup truck was also taken to hospital with what appeared to be minor injuries. The driver of the stolen cab suffered minor injuries. He fled the scene but was arrested nearby. Police say excessive speed was a factor in the crash.